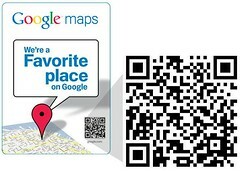 Google also announced that they are sending out stickers to be placed in shop windows that have QR barcodes. The goal is to allow people to scan the sticker and look up more information about that place. You can see some samples of these businesses in LA over here. How do you get one of these stickers for your business? Well, make sure you are a verified business on Google Local Business Center. Make sure to complete your profile to the T. Then, it is up to Google. TechCrunch reports Google has "PlaceRank" algorithm to determine in which order do businesses get these decals. Google will be adding these businesses incrementally. "They are selected based on their PlaceRank," says John Hanke, VP of Google Earth, Maps, and Local. PlaceRank is like PageRank for places It tries to figure out how prominent a place is based on factors such as "references on the Web, reviews, photos," says Hanke, "how many people know about it, how long its been around." Bill from SEO By The Sea covered this PlaceRank algorithm years ago.